[Closed] How would I get what part of a skeletal mesh I hit using c++? I have a bullet and a player I need to be able to detect what part of the mesh I'm hitting for things like head shots. Hello, so sorry for brining back an old topic but could you guys direct me to a tutorial on how i can create my own hit boxes with blueprint? This is a post from before the engine launched and a lot has changed. Please make a new post with your question. Thank you! I have video proof of this that I specifically made to demonstrate this! I have skeleton swing a bunch of times, well within the collision capsule, and it misses! and then right when the idle anim is playing and the big skeleton's hand comes juuuuuust in range of the sword tip, THEN the hand goes flying and the skeleton registers a hit! The hand going flying is proof I accessed that exact bone and applied an impulse. The big skeleton neeever moves, it is just the idle animation and the bone movements that are determining when the skeleton is in range of the sword tip! This video is pretty much the code and method I mention in this UDN post. and thanks for the pics and taking the time! but I do feel that Christopher is right, and the Physics asset is being used with LineTraceComponent, and not just the whole-body mesh. Great clarifications for the Community! Thanks for the video, but I had already acknowledged my mistake in a reply to his comment, so it was a bit unnecessary. I was under the impression that it would trace the mesh directly, not the physic bodies. That turned out to be wrong. It might be an idea to post in that comment chain that you put a video in a new answer, or just move it to the comment. It will make it a bit clearer for new readers. but a demo for all readers of this thread in the future. Rama's solution is pretty solid. It works especially well if you wanted highly-accurate collision detection, as it is tracing against the mesh itself (not against hand placed collision boxes like my suggestion). It does, however, make it a bit difficult to detect exactly where the bullet hit (you would have to check the name of the bone against a list of compatible target bones, a messy and inaccurate process, especially with an abundance of facial joints or sloppy weighting). This isn't a problem at all if you have multiple skeletal mesh components making up the body, but I'm going to assume that you don't. A more tried-and-tested solution is to attach a number of small 'collision boxes' to important parts of your character. I'm going to use Counter Strike as an example, a popular networked FPS in case you are unfamiliar with it. It is very easy for you to determine which area was hit, as well as providing per-area hit handling (such as damage modifiers (feet vs. head), per-component trace layers (so explosions hit only certain pieces, etc), and wound tracking). By no means are collision boxes the only way to do these things. You could do them with mesh tracing too, if you really wanted, it would just require a different implementation. Lastly, here is the article that I sourced (pun intended) the second image from. It is a worthwhile read if networked games interest you, even if you don't use collision boxes for your implementation. Requires manual setup for each mesh, leading to difficulties if you decide to change the setup down the track (for example split the chest box into two boxes, you would need to go through each mesh you had already worked on). 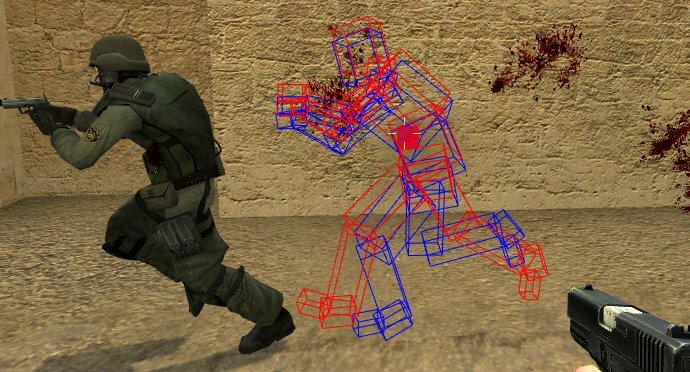 Decals (such as blood) applied on hit could 'float' in some circumstances, as the underlying mesh is no longer used for collision detection. These can both be overcome with varying implementations, but I figured I would put them here for completion sake. From what I recall, bTraceComplex only traces againsst the actual mesh when traced against static meshes. 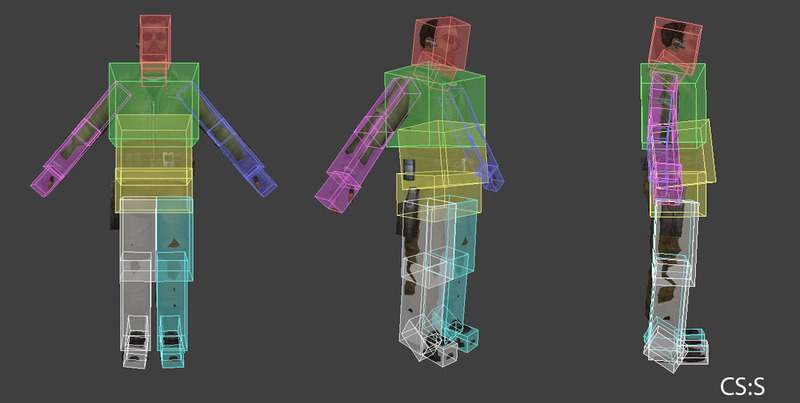 For skeletal, it will return the physics asset bodies, which is the same as what you describe. Hmm, interesting. I looked into it a bit more myself, and you're right. The bone name returned by the hit should be accurate enough then (since it would be based on the physic body instead of a direct trace, returning the nearest bone like I had incorrectly assumed) to be used for location detection. The only reason to manually set up the boxes like in my solution would be to apply per-area modifiers to them, but you could achieve that anyway with a list of bone modifiers on the character. My solution is a bit out-dated I think, Unreal has already solved it. *  Trace a ray against just this component. //could replace NULL with this if you want to ignore the owner of the trace. //CombatHit.BoneName   //<----tells you the bone name!!!! * Whether the trace started in penetration, i.e. with an initial blocking overlap. * (ie, Normal may not equal ImpactNormal). * this value is the distance along Normal that will result in moving out of penetration. * If the distance cannot be computed, this distance will be zero. A great solution (as expected of Rama). It's nice having an engine that can do this kind of stuff. My previous experiences with this subject have been frustrating to say the least (I'm looking at you Unity3D! ).